This was one of the best condo we have stayed. Clean and easy to get to. The furniture was in very good condition. Mattresses were very nice. Towels were great. 7 women had the best 5 days ever. Even with Nate storm, we had a great time. Comfortable, equipped, clean, perfect location. Our first time to the Florida peninsula and our stay was perfect. Thank you! This is a great choice! There are so many fantastic elements of this property! It is very clean and spacious, the balcony has plenty of room and seating, beds were comfortable, the parking is close, elevators are fast and plentiful, the beach is pristine, chairs are easy to reserve, and its a friendly, quiet facility. I liked that there were extra options like two pools, indoor gathering room, and game room. The location is far enough away from the craziness but easy to access everything. The included coupons were a bonus that we loved! Yay for a free pizza for the first night! Loved it! Very clean condo. Loved our stay! Would come back! Great place to stay Condo was very clean and had plenty of room for 2 adults and 5 teenagers. Beach was perfect. Shell island is a must do when visiting here. VIP did a great job keeping me informed and we were able to get into the condo as soon as it was ready. (about 2 hours early.) Kitchen was well equipped for cooking. Views from the huge balcony were awesome. Pools and hot tub closed at 10:00 which was kind of a bummer for the teenagers but not a big deal. Ill definitely be back next year if not sooner. A great stay! The 6 kiddos (ages 8 months to 15) had a blast, rain and all, and we stayed at Princess 4 of the 5 days all day. The other day we went to St ANDREWS State Park to kayak. We all loved Princess. Many thanks. Amazing view.... beautiful condo! We were nothing less than impressed. What you see is what you get. It was very clean and very nice! The view was amazing. No stress with a check in or out. Everything was perfect I would recommend to anyone! We will definitely be back! Amazing condo; perfect for a family vacation We were MORE than impressed with this unit. Being on the end allowed us to have unobstructed views of the sunset on our amazingly spacious balcony. The amenities were top notch with great beds, awesome bathrooms, and even a triple showerhead in the Master bath. We had way more than enough space including a laundry room with a big sink instead of the traditional stackables that typically come with beach units. Jennifer and Donna were super helpful with everything leading up to our stay, even texting us around noon to let us know that our condo was clean and ready for us. Overall we were thrilled with our experience and already planning our stay for next year. The unit was wonderful. Clean, spacious and everything shown on the Web and more. Beautiful view. We had a wonderful stay at the Princess, unit 1205. Donna and Jennifer made us feel welcome from the start. The beach was not that busy so it was a great place to introduce my grandbabies to the beach. Our family really enjoyed the LARGE, beautifully decorated, updated beach condo. The facilities at the Princess were very nice also with the outdoor/indoor pools and bathrooms in the breezeway area. We especially liked the extra security with using gate codes for the elevators and beach access. Jennifer & Donna were fantastic to deal with while coordinating our stay. Will stay here again. Loved it! We stay last two years and loved the spacious Our family of 10 including grand kids, have stay in this same condo 1403 at the Princesses last two years. We love the roominess of each bedrooms, lot of space in the kitchen area and has a small floor model ice maker for its guest. Easy access to the beach with ramp system and not just stairs to the beach. There are three elevators which dont take a lot time to reach the higher floors. Also its located on Thomas Drive which has last traffic then west side and we use Back-beach Road to Pier Park which avoids traffic on Front Beach Road. Great place for family! We had a wonderful time during our stay in July! There were 7 adults and one infant and we had plenty of space. One of the things that I looked for in choosing a place was that there was enough seating at the table and in the living room for all of us (so many places advertise that they can accommodate large groups but dont provide enough seating for everyone). This place fit the bill. We LOVED that each bedroom had its own bathroom! The balcony was large, again with lots of seating. Each morning we enjoyed our coffee while watching the boats head out, and we saw dolphins, a variety of birds, and even a manatee. We enjoyed peaceful evenings out there, too, watching the sunset and watching people stroll up and down the beach. Another plus was that the building wasnt huge (no craziness unpacking/packing the car or overcrowded beach). The building is located in a quieter part of PCB, so the beach was peaceful, well-maintained, and family-friendly. We enjoyed preparing and eating most of our meals together so we appreciated that we were within a short distance to grocery stores. The owners were easy to communicate with prior to our arrival and very quick to respond to a concern we had, which turned out to be nothing. Overall, we highly recommend it and would stay there again in a heartbeat! The Princess is our all time favorite and the condo is just beautiful and so well maintained. Our family throughly enjoyed our stay in your condo. The weather was just perfect and we made so many memories that I know we will always treasure for years to come! Thank you so much for sharing your get away with us!! 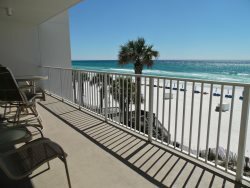 Beautiful, spacious condo in the quiet part of PCB. Six of us stayed here in mid August for a family vacation. The condo was perfect! It has lots of space and is beautifully furnished. It is even better than it looks in the pictures. The view from the balcony on the 16th floor is awesome. We lucked up with perfect weather and the water was so pretty and clear it looked like the Caribbean. The beach chairs/umbrella set up that comes with the unit is great, along with the extras they provide for you to use on the beach (beach toys, umbrellas, low chairs, etc.). This part of PCB is quiet and away from the traffic yet you can quickly get to Pier Park or wherever else you want to go. We were also very impressed with Jennifer (with VIP) and how she handled everything. VIP takes great care of you from start to finish! I highly recommend this property and specially this unit. We will definitely return and use VIP again. The condo was even more than we expected. It was neat and clean and beautifully decorated. Our stay was great. We had so much room and even though I usually dont like to stay on the higher floors, the 16th floor definitely had the best views. I appreciate all the efforts that went into helping us have a wonderful Labor Day weekend. The weather was good and the ocean water was so clear and just the perfect temperature. Thanks for making our stay so good. We will definitely book this condo again. Awesome in every way!! Awesome condo with a SPECTACULAR view! Very clean, well furnished, well stocked, comfortable, spacious and welcoming! Great place to stay!!! The room was very well equipped and the view was wonderful. Only a few steps and u are on the beach which was so convenient especially with children. The people managing the condo were so nice and on top of anything needed. Going back next year!!!!!!! We loved our room! Thank you Jennifer & Donna! Our room was just as you both had promised. It was a pleasure to book with you all and we will definitely be back! Jennifer and Donna are great. They have to be the best VRBO group I have ever worked with and we use vrbo at least a couple times a year. They seemed to really care that things were right when we got there and during our entire stay. The condo was extremely clean and it is huge. We really enjoyed the trip and I would definitely check with them first for availability on our next trip to Panama City Beach. I highly recommend them. Wonderful condo which made a great vacation!!! Management company was great and will definitely use them on our future visits! So easy to work with and a pleasure to deal with too!! The condo was very clean when we arrived and had everything we needed! Very spacious and plenty of room for all of us. Very large balcony and the view was great, cant wait to return!!! We have been going to Panama City Beach for the past 15 years. We have become quite partial to the Princess Condos. It is a family place that doesnt have a lot of rooms on the quiet end of the beach. This was the best condo that we have ever had there. The ladies at VIP Beach Rentals are so very nice and helpful. The room was very clean (and I am picky about that!). The beds were comfortable and the kitchen was very well stocked. They had everything you could possibly want! We will definitely stay here again and will always rent from VIP Beach Rentals in the future. This was our 2nd stay at the princess but family with us had never been to Panama city. When we opened the door to the condo it was WOW... OOOHHH...AAHHH. they could not believe how clean, spacious, and beautifully decorated the condo was. Everything was perfect... Exactly as the pictures on line. Staff was extremely nice! We would definitely go back! !